Soaring energy prices, signs of a human-made climate change and legislative pressure have brought the energy consumption of machines to the attention of machine tool builders and their customers. 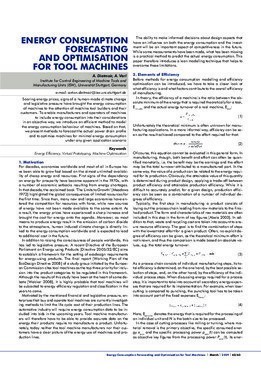 To enable manufacturers and operators of machines to include energy consumption into their considerations in an objective way, we introduce an efficient method to model the energy consumption behaviour of machines. Based on that, we present methods to forecast the actual power drain profile and to optimise machines for minimal energy consumption under any given application scenario.